Monitoring pollutants in air, soil and water is a routine requirement in the workplace, and in the wider environment. Passive samplers can provide a representative picture of levels of pollutants over a period of time from days to months by measuring the average concentrations to which they have been exposed. Air monitors are widely used, for instance to measure the exposure of workers to volatile compounds, but also for monitoring the fate of pollutants in the atmosphere. Passive sampling devices are now becomining increasingly used to monitor pollutants in rivers, coastal waters and ground water where contamination results from sources such as domestic and industrial discharges, and the use of agrochemicals. Passive Sampling Techniques in Environmental Monitoring provides a timely collection of information on a set of techniques that help monitor the quality of air, surface and ground waters. Passive sampling can provide an inexpensive means of obtaining a representative picture of quality over a period of time, even where levels of pollutants fluctuate due to discontinuous discharges or seasonal application of chemicals such as pesticides. Recent changes in legislation have increased the pressure to obtain better information than that provided by classical infrequent spot sampling. 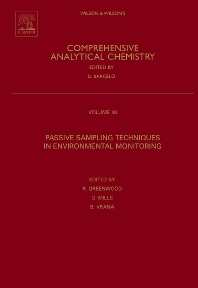 Brought together in one source, this book looks at the performance of a range of devices for the passive sampling of metals, and of non-polar and polar organic chemicals in air and in water. The strengths and weaknesses and the range of applicability of the technology are considered. For practitioners in the field of water and air quality monitoring. Regulatory managers to provide summary of available technology to support monitoring in the field of air and water quality management. Researchers for research in environmental chemistry and toxicology.